Makes: around 4 Servings of Masala Potato. Boil the whole potatoes in water till they are just soft. Strain the potatoes, peel and dice them. Wash and chop tomatoes into big chunks. Wash and roughly chop cilantro leaves. Grind poppy seeds into fine powder using a grinder. Add the coconut and yogurt and grind again into smooth paste. When mustard seeds start spluttering, add sliced onion and green chiles. Fry briefly, stir in potatoes, turmeric and salt and fry till potatoes start to change color. Add ginger garlic paste and tomatoes and fry briefly. Then stir in ground poppy seeds coconut paste and few tablespoons of water if necessary. Cook on low flame till oil separates and then stir in garam masala powder and cilantro. Notes: Make sure potatoes are boiled well. Variations: Check other potato recipes here. Lemon cucumber is peeled and chopped into thin chunks. It is then cooked along with whole spices and onion. Once cucumber turns soft, serve lemon cucumber onion curry over plain steamed rice or with roti. Makes: around 4 Servings of Lemon Cucumber Onion Curry. Peel, wash and halve the lemon cucumber. Discard the seeds and chop the lemon cucumber into thin inch size pieces. Toast urad dal until light golden brown and remove from heat. Roast the red chiles for few seconds and remove from heat. Grind the urad dal, red chiles into fine powder using a spice grinder. Then add the chopped onion and pulse couple of times and remove onto a bowl. When mustard seeds start spluttering, add lemon cucumber pieces and salt. Cook covered on low flame for couple of minutes till cucumber pieces are half cooked. Stir in ground onion red chili paste, tamarind extract, jaggery, turmeric powder and salt. Cook covered on low flame for around 8 minutes or until cucumber pieces turn soft. Add a splash of water if required while cooking the onion to avoid it sticking to the bottom of the pan. Serve lemon cucumber onion gravy over plain steamed rice or with roti. Notes: Make sure cucumber is cooked well before removing from heat. Suggestions: Adjust spice with red chiles. If cucumber or onion is not cooked well, put the curry back on heat and cook covered on low flame till done. Variations: Check other recipes with lemon cucumber here. Other Names: Lemon Cucumber Onion Curry, Dosakaya Ullipaya Kura. Ridge gourd / turai is peeled and chopped up into small chunks. They are then cooked in oil along with whole spices and freshly ground ginger green chili paste. 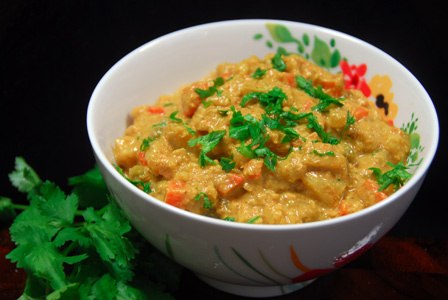 Serve quick ridge gourd curry with plain steamed rice or with roti. Makes: around 2 Servings of Quick Ridge Gourd Curry. Remove skin, wash and chop the ridge gourd into small chunks (around 2 Cups). Remove stem, wash and roughly chop the green chiles. Grind ginger and green chile into coarse paste using spice grinder. When mustard seeds start spluttering, add chopped ridge gourd, ground ginger green chili paste and salt. Mix well and cook covered on low flame till ridge gourd turns soft (around 8 minutes). Stir in turmeric powder and adjust any seasonings if required before removing from heat. 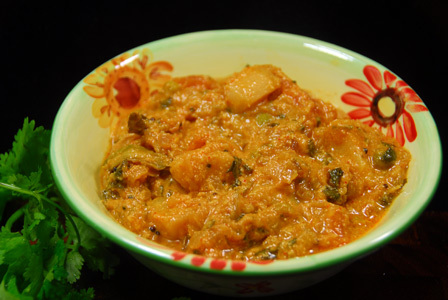 Serve quick ridge gourd curry with plain steamed rice and dollop of ghee. Notes: Make sure ridge gourd is cooked thoroughly before removing the pan from heat. Suggestions: If ridge gourd is not cooked well, put it back on heat and cook covered on low flame till done. 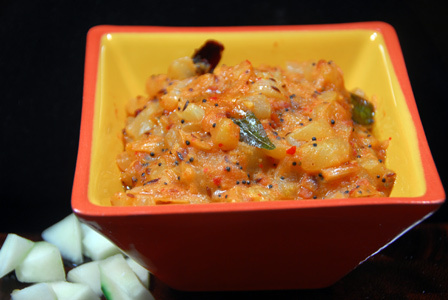 Variations: Diced onion can also be added along with ridge gourd. 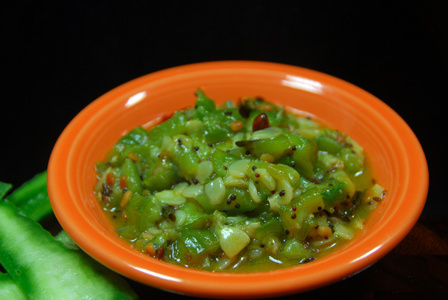 Check other ridge gourd recipes here. Other Names: Quick Ridge Gourd Curry, Beerakaya Allam Karam. Ridge gourd is lightly peeled and chopped. It is then cooked in plain milk till soft. Freshly ground mixture of coconut and cilantro is added to the ridge gourd as a finishing step. Serve ridge gourd with coconut and cilantro over steamed rice or over roti. Makes: around 4 Servings of Ridge Gourd With Coconut and Cilantro. Remove ends, lightly scrape and wash the ridge gourd. Lightly peel and chop the ridge gourd into small chunks (around 3 Cups) and keep aside. 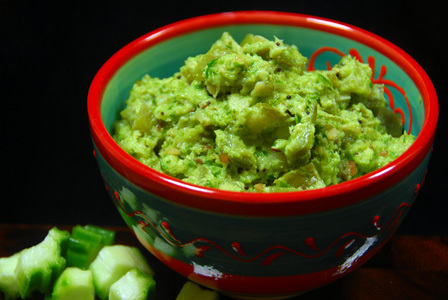 Grind green chiles coarsely using a spice grinder. Then add the chopped cilantro and coconut and grind again into somewhat coarse paste and remove onto a bowl. When mustard seeds start spluttering, add chopped ridge gourd and milk. Cook covered on low flame for around 8 minutes or until ridge gourd softens a bit. Uncover and cook till ridge gourd is completely cooked. Stir in ground coconut cilantro mixture and sufficient salt. Cook for another 2 minutes and remove from heat. Serve ridge gourd with coconut and cilantro over steamed rice or over roti. Notes: Make sure ridge gourd is cooked well before removing from heat. Suggestions: Adjust spice with green chiles. Reduce the cooking time and amount of milk if you peel the ridge gourd completely. Other Names: Ridge Gourd With Coconut and Cilantro, Beerakaya Kobbari Kothimera Kura.